We all know that iPad is one of the most popular multipurpose devices. The device is packed with entertaining stuff like gaming, movies, music, etc. Its full HD display makes it even better. In this article we will guide you with step by step method to download movies to iPad and how to download music on iPad without iTunes. There are two ways through which you can download movies to iPad without using iTunes. We have discussed both the steps below. Just follow the steps given below and you can easily download free movies to your iPad. The first process for downloading movies involves the use of cloud storage. Even though cloud storage is one of the easiest ways of transferring movies to iPad, it is also the longest way. To start with, one has to decide which cloud storage service he would like to use. There are a lot of options available out there. The most popular of them are Dropbox and the Google Drive. Dropbox offers 2 GB of free storage when a user signs up and 500 MB for every referral that can reach up to a maximum of 16 GB. So let’s see how we can do free movie downloads for iPad using Dropbox. First step is to Install the Dropbox app on your iPad and also on your computer. Next step is to simply copy and paste the selected movie from your PC to the Dropbox folder. The movie will be synced to Dropbox in some time which actually depends on the size of the file and the speed of your internet connection. Hence you need an unlimited high speed internet connection if you want to use this process for a long time. After the syncing has finished you can just open the dropbox app on your iPad and find the uploaded movie file there. You can simply play the movie file by tapping on the icon. If your internet connection is good then it would start streaming immediately. You can also download the movie for viewing it later. You can do this by just tapping the start at the top right corner. This will save the movie on your iPad. The next method by which you can download movies to iPad is by using third party applications. This method does not need an unlimited internet connection. To get started, you need to install a third party app that will interact with the storage of your device. 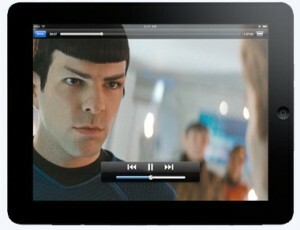 You will also need a video player to play the files downloaded on the iPad. So let’s see how to download movies to iPad by using a third party application. Install a third party app which allows interacting with the device storage. One such app is the iExplorer. And then you’ll need to install an app for playing the videos. You can download any free app available for this purpose. Connect your iPad with your PC and open the iExplorer app. The iPad would get detected automatically and you can access the device’s storage easily. To download movies to iPad just select the Files menu and then select Apps. Now you’ll reach to the folders in your iPad. Open the Folder where your videos are located. Now select the movies that you want to transfer and drop it into the download folder of the video playing app. A progress bar will appear in the bottom right corner where you can see the downloading status of your movie. When the download is finished, you can open your Video player app. Here you can find the movie that you have just downloaded. Hope you have successfully transferred your movies by using one of these methods. If you are facing any problem then feel free to comment below.